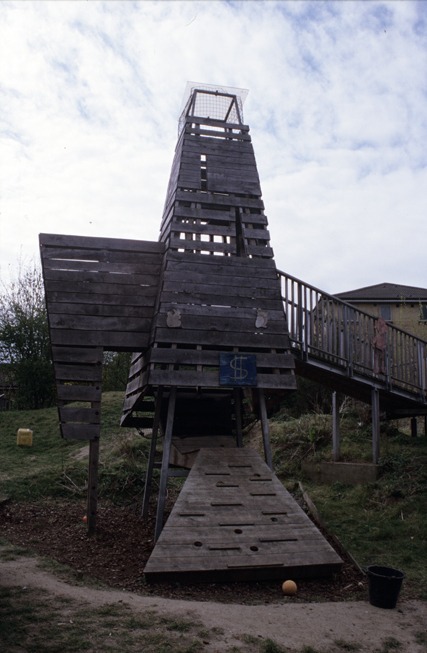 Evergreen Play Association was built on a former wasteground and stonemason's hut in the early 1970s and was set up by local parents. The site used to be flat but there are now a variety of areas including mounds, a small wooded zone and a garden. A children's committee was formed to gather ideas for the playground, mapping pathways and working with architects to plan treehouses and other adventure play structures. There is now a Skyden, a Rocket and an aerial runway. Bees are kept at the playground and their honey is sold locally. As of 2002 Evergreen has been integrated for disbled children. These photos and the information were compiled in 2003.